^ Morrison, Samuel E. (1927). Oxford History of the United States 1778-1917. pp. 182. ^ Graetz, Michael J.; Schenk, Deborah H. (2005). Federal Income Taxation: Principles and Policies. New York: Foundation Press. p. 4. ISBN 1-58778-907-8. ^ Hogeland, William (2006). 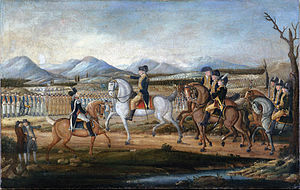 The Whiskey Rebellion: George Washington, Alexander Hamilton, and the Frontier Rebels Who Challenged America's Newfound Sovereignty. Scribner. pp. 130. ISBN 978-0-7432-5490-8. ^ The Whiskey Rebellion: A Model For Our Time? Baldwin, Leland. Whiskey Rebels: The Story of a Frontier Uprising. Pittsburgh: University of Pittsburgh Press, 1939. Cooke, Jacob E. "The Whiskey Insurrection: A Re-Evaluation." Pennsylvania History, 30, July 1963, pp. 316-364. Hogeland, William. The Whiskey Rebellion: George Washington, Alexander Hamilton, and the Frontier Rebels Who Challenged America's Newfound Sovereignty. Scribner, 2006. Kohn, Richard H. "The Washington Administration's Decision to Crush the Whiskey Rebellion." Journal of American History, 59, December 1972, pp. 567-584. Rothbard, Murray N. "The Whiskey Rebellion: A Model For Our Time?". Free Market, Volume 12, Number 9, September 1994. この記事にはアメリカ合衆国内で著作権が消滅した次の百科事典本文を含む: Chisholm, Hugh, ed. (1911). "Whiskey Insurrection, The". Encyclopædia Britannica (英語) (11th ed.). Cambridge University Press.